Based on a player piano and using custom bell tones constructed in a Yamaha QY100 midi module. 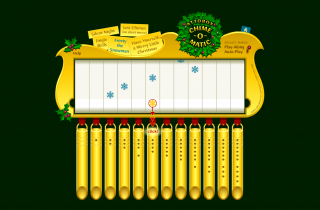 The sounds were based on a combination of wood blocks and glass bells. This was an experiment in non-linear interface design where a user can easily move from any one process to another. For example, a new song can be chosen at any time causing the current song to be immediately dropped. That may seem like a common concept today, but in 2002 it was very nearly revolutionary thinking. FLASH DISCLAIMER: as web standards move forward, there is an increasing chance these flash samples will simply stop functioning. When that happens, these samples will likely come down and we will turn the page on what was once such a promising technology.